The route of Highway 19, illustrated on Google Maps. VICTORIA, B.C- The highway from Parksville to Campbell River is getting slower. 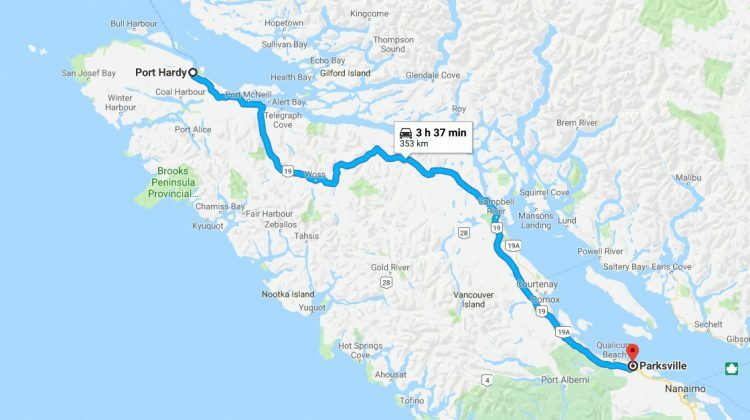 According to an announcement from the provincial government, the highway route is one of 15 sections across British Columbia to get its speed limit dropped by 10 km/h as of this week. This means the route will go from 120 km/h to 110 km/h. All the of affected areas had their speed limits raised four years ago, with a rise in collisions recorded afterwards. The speed limit from Bloedel to Sayward will be going down to 90 km/h from 100 km/h. Campbell River to Bloedel and Port Hardy to Port McNeill will remain the same at 90 and 100 km /h. “Since the former government raised speed limits in 2014, serious crashes have been on the rise,” Transportation Minister Claire Trevena said in a statement. According to the province, driver inattentiveness, road conditions and driving too fast for conditions were factors in the collision increases. The original increases were put in place as part of the province’s Rural Safety and Speed Review, which was applied to 33 sections of highway. Increases for 16 sections will stay the same, where crash rates were not affected. Speed limit raises for two others were reduced in 2016. RCMP enforcement will be getting boosted in crash-heavy areas, in order to ensure drivers are complying with the new limits. According to Inspector Tim Walton, who recently took charge of Island District Traffic Services, slowing down can reduce the severity of a collision and lower the chance of drivers getting killed or severely injured. “As we shift into winter driving mode, police are reminding drivers to obey speed limits, adopt safe and defensive driving habits, and to drive sober and distraction-free,” Walton said in a statement.